Here's a little boat that is very simple to make. Why not make a whole fleet of them? Split a nut with your knife and remove the meat. Mold some candle wax and put it in the shell. 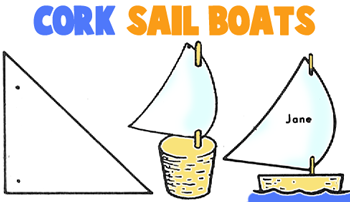 Form the sails by cutting paper into the shape shown and draw a toothpick through. Press the toothpick into the wax. Now set your boat in water and away it sails. To make this boat you need cardboard, a pair of scissors, tape and a few drops of light oil. First, cut the boat out of the cardboard. Cut a small notch in the back. Cut out a triangular like sail out of paper for the boat. Fasten the sail to the boat with tape. 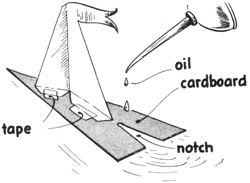 Put the boat in still water and squeeze a drop of oil in the notch. Now watch the boat sail away. Did you ever notice that corks float? Well they do...so they are perfect to make rafts from. So find a bunch of corks and glue them all together side to side as illustrated in the picture above. Next draw flags in the designs of your choice....color them or whatever you want to do. Then put a tiny hole in the top and bottom of each flag. You will need 2 for the raft. Then get a toothpick for each flag, and then stick them thru the flags and then into the boat as illustrated above. Now go play with it in your bathtub and have a bunch of fun. In order to turn a cork into a sail boat, you will firstly ned one large cork. Then cut a 2 inch x 2 inch piece of paper out. Cut that piece of paper into 2 triangles. If you want to, write something on one of the triangles for the sail. Push a toothpick through this trianhgle sail in 2 places and then stick it into the cork as pictured above. 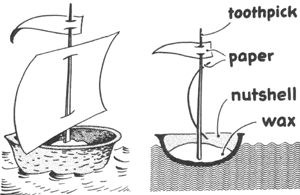 All that is left to do is to sail your sail boat in a pan of water. Have fun. Milk Carton Sail Boats - Learn how to make these milk carton sail boats...they turn out so pretty. Milk Carton Row Boats - Learn how to make these awesome row boats, with oars and seats. These are made from milk cartons....cool. Making a Boat from a Sardine Can, Cork, Needle - Learn how to make a York Boat. Viking Ships - Learn how to make this viking ship out of real wood, toothpick oars, cork shields, and popsicle stick prow. Use Fallen Branches to Make a Toy Raft - Now you can find out how to make miniature rafts for your figurines...it really floats. Make a Stern Wheeler That Has Working Paddles - This boat really runs on a motorized paddle ... that works with a rubber band. This is a woodworking project and requires parental assistance. Create Noah's Ark - Learn how to make Noah's Ark with Cardboard Boxes - and also create Noah's animals as well. Wooden Sailboats - This is a great first-time woodworking project to make with your child...easy enough for first-timers. The sail can be made out of wrapping paper or sheet cork.